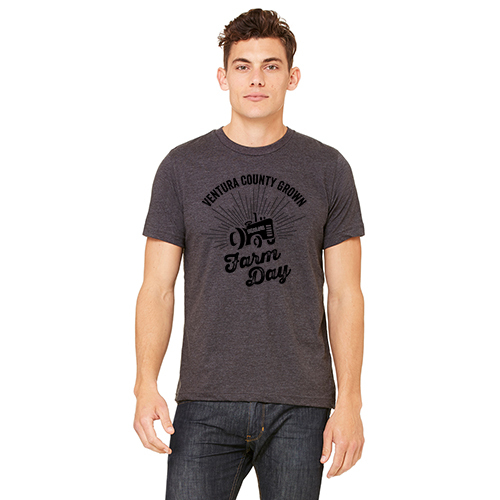 Show your support of Ventura County Farm Day year-round with our comfy apparel and accessories! This ladies 4.2 oz, 52% combed ring spun cotton, 48% polyester V-neck tee is great for everyday wear and is true to size. Decorated with the Farm Day logo in red on the front. Feel proud to support Ventura County Farm Day! This unisex 4.2 oz, 52% combed ring spun cotton, 48% polyester tee is great for everyday wear and is true to size. Decorated with the Farm Day logo in black on the front. Feel proud to support Ventura County Farm Day! 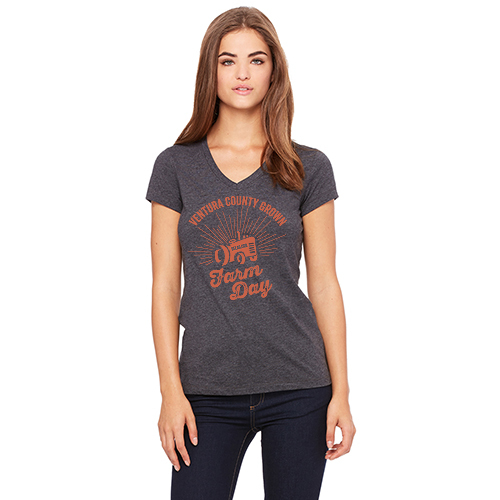 Soft and comfortable, this Bella & Canvas youth shirt is 4.2 oz., made of 52% combed ring spun cotton, 48% polyester and is decorated with the Farm Day logo on the front in red. Enjoy sporting this cotton twill-mesh cap. This is a charcoal/white two tone, medium profile six-panel structured cap with mesh back. Adjustable white plastic snap tab closure. Ventura Farm Day logo embroidered in a burnt orange thread, front and center. SEEAG.org is also embroidered on the back of the cap in the same burnt orange. Enjoy your favorite wine in this 15 oz. stemless wine glass with the Farm Day logo printed in red on one side. Enjoy your favorite cold drink with this 16 oz. glass featuring the Farm Day logo in red on one side. Enjoy your favorite coffee or tea in this 14 oz. single-wall ceramic mug with matte black exterior and gloss red interior with the Ventura Farm Day logo in red on one side.